Describe how actions help your users. Describe the difference between object-specific and global actions. Create an action and add it to a page layout. You know the saying that you should judge someone only by their actions? That’s true in Salesforce, and your users will judge you favorably when you give them access to awesome customized actions. Actions let your users quickly do tasks, such as create records, log calls, send emails, and more. With custom actions, you can make your users’ navigation and workflow as smooth as possible by giving them quick access to information that’s most important. When thinking about what actions you might want to create, ask your users what they really wish they could do. For example, you might create an Emergency Order action for your food service company that allows delivery drivers to immediately order extra or missing food items. Creating actions that your users need can drive adoption in your organization and make you a hero to your users! In previous units, we glossed over the actions sections of the object page layout. This unit is where we explore those areas of the page layout and give you a taste of how actions can enhance your users’ Salesforce experience. Object-specific actions have automatic relationships to other records and let users quickly create or update records, log calls, send emails, and more, in the context of a particular object. For example, you add an object-specific action on the Account object that creates contacts. If a user creates a contact with that action on the detail page for the Acme account, that new contact is associated with Acme. Object-specific actions live on the page layout for the object. There are several types of object-specific actions. 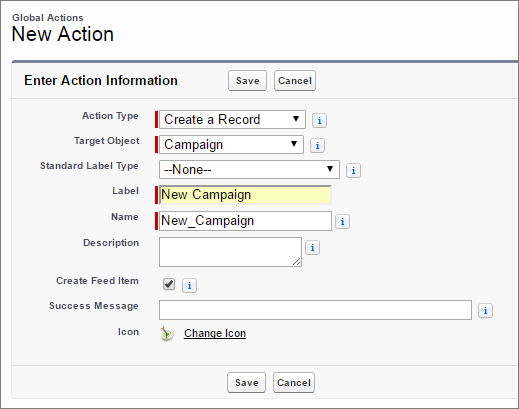 Object-specific create actions create records that are automatically associated with related records. Object-specific Update a Record actions make it easy for users to edit records. You can define the fields that are available for update. Object-specific Log a Call actions let users enter notes about calls, meetings, or other interactions that are related to a specific record. Object-specific custom actions invoke Lightning components, flows, Visualforce pages, or canvas apps that let users interact with or create records that have a relationship to an object record. If you’re new to Visualforce, don’t worry. You can learn all about it in another module. For now, remember that Visualforce pages allow you to do really cool customizations in your actions. Object-specific Send Email actions, available only on cases, give users access to a simplified version of the Case Feed Email action in the Salesforce mobile app. You can use the case-specific Send Email action in Salesforce Classic, Lightning Experience, and the Salesforce mobile app. You create global actions in a different place in Setup than you create object-specific actions. They’re called global actions because they can be put anywhere actions are supported. Use global actions to let users log call details, create or update records, or send email, all without leaving the page they’re on. Global actions live on a special layout of their own, known as the global publisher layout. It isn’t associated with an object, and it populates the global actions menu in Lightning Experience. 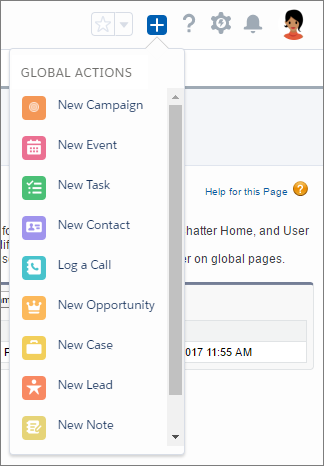 Users can access the global actions menu by clicking in the Salesforce header. If an object page layout isn’t customized with actions, then the actions on those object record pages are inherited from the global publisher layout. There are more types of actions than just these two, but some of them aren’t customizable. We’re going to explore only object-specific and global actions in this unit. You might see actions referred to as “quick actions” in Salesforce. It’s true, they’re quick and your users will love them. The quick part is just a category and means that the action is either object-specific or global and not some other kind of Salesforce action. Maria wants to give her users an easy way to create energy audit records. Right now, the only way to do that is in Setup, and many of her users don’t have access to it. She’s going to create an object-specific action that lets her users create energy audits right from account records. Because it’s an object-specific action, the new audit records will be directly tied to the accounts they’re created from. There are already some actions in the highlights panel on energy audit records. Those are default actions, inherited from the default global publisher layout. Maria’s going to create her new object-specific action, add it to the Account page layout, and then customize the actions that users see on account records. You’re already in Setup, so click Object Manager, then click Account. Click Buttons, Links, and Actions, then click New Action. Maria wants this action to create audit records, so select the Create a Record action type. Select Energy Audit as the target object. This is the type of record that the action creates. Call the action New Energy Audit. This is the text users see for the action. After you create the action, you can customize its layout using the action layout editor. It’s like the page layout editor but for actions. With the action layout editor, you can customize the fields the users must populate to complete the action. Just like the page layout editor, the upper part of the action layout editor contains a palette, and below it is the action layout. The palette contains fields from the action’s target object that you can add to the action layout. Each field on this action layout has a red asterisk, indicating that it’s a required field. Required fields are added to an action layout by default when you create the action. If you remove a required field from an action layout, then users can’t successfully complete the action. In this case, that means that users wouldn’t be able to create the energy audit record. Audit Notes and Type of Installation are fields that could be populated after the audit record is created. So let’s leave this as-is and move on to the next step: making the action available to users. To make the New Energy Audit action available to users from an account record, Maria must add the action to the Account page layout. There are two actions sections on a page layout. 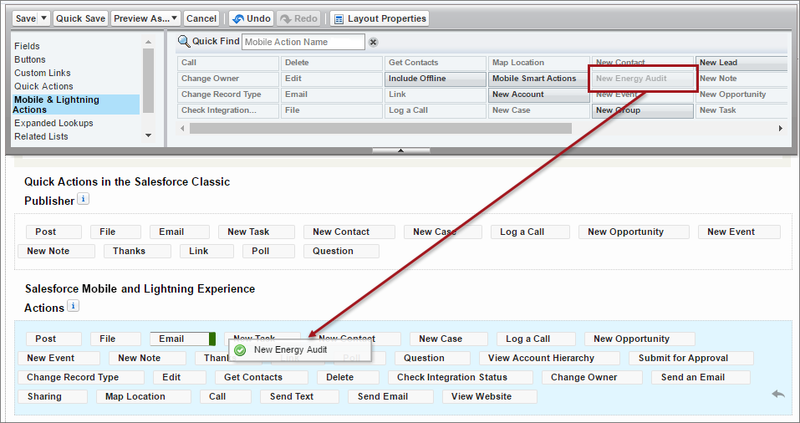 The Quick Actions in the Salesforce Classic Publisher section controls which actions appear on record pages in the Salesforce Classic UI. The Salesforce Mobile and Lightning Experience Actions section controls which actions appear on record pages in both Lightning Experience and in the Salesforce mobile app. If you don’t customize the action sections of a page layout, then the actions you see in the Salesforce app and Lightning Experience come from a set of default actions defined by Salesforce. In the Salesforce Mobile and Lightning Experience Actions section, click to override the defaults. The actions you see when you override the defaults are a combination of the default actions for the object, plus any custom and standard buttons on the page layout. When the Salesforce Mobile and Lightning Experience Actions section isn’t customized, the Lightning page for the object takes the custom and standard buttons from their respective button sections on the layout to display on the page. However, once you override the defaults, any standard and custom buttons you want to appear on your Lightning page must be included in the Salesforce Mobile and Lightning Experience Actions section as actions. 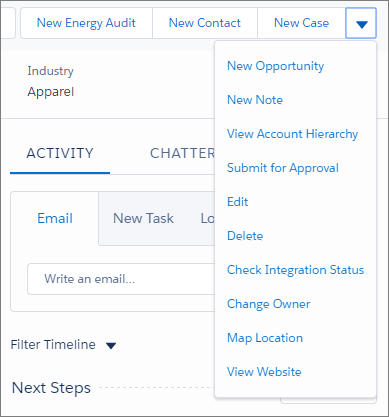 Select Mobile & Lightning Actions in the palette and then drag the New Energy Audit action to the Salesforce Mobile and Lightning Experience Actions section. You can adjust the order of the actions by dragging them around. Let’s do a bit of cleanup. Drag these actions off the layout and back to the palette. Excellent! 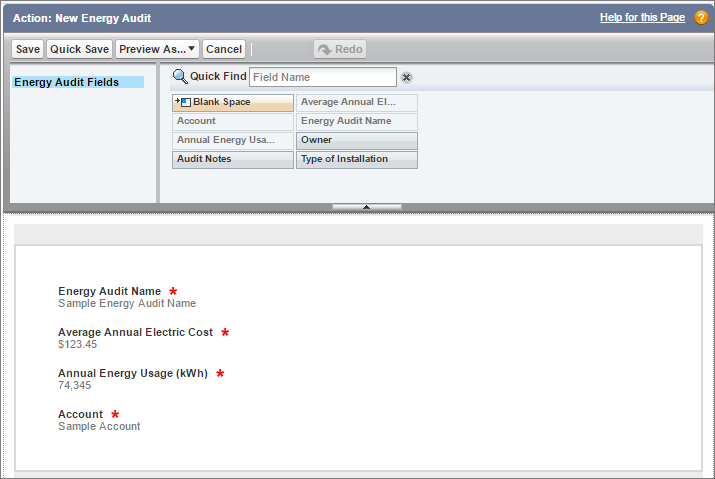 Now Maria’s users can easily create an energy audit record that’s automatically associated with an account. Her users will see the new action on the page-level action menu. Let’s take a look. Although they’re actions, Email, Log a Call, New Event, and New Task don’t show up here. Because they’re associated with activities, they appear under the Activity tab. Standard Chatter actions like Post and Poll show up under the Chatter tab. The Sales team has asked Maria to create an action that lets users create a campaign no matter where they are in Salesforce. A global action is an ideal way to do this, because the global actions menu appears at the top of every page. Creating a global action looks a lot like creating an object-specific action except you start on a different page in Setup. From Setup, click the Home tab. Enter Global Actions in the Quick Find box and click Global Actions. Select Create a Record for the action type. Select Campaign for the target object. Enter New Campaign as the label for the action. 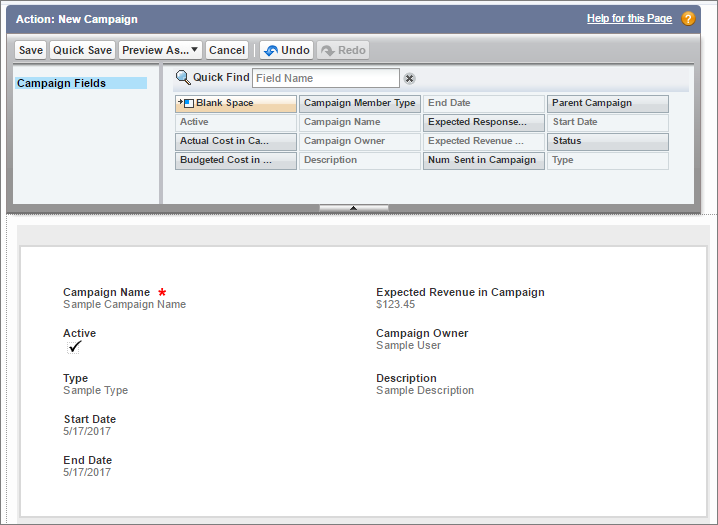 On the action layout, remove the Parent Campaign field and add the Expected Revenue in Campaign and Campaign Owner fields. As we mentioned earlier in the unit, global actions live on a special layout of their own, known as the global publisher layout. The global publisher layout populates the global actions menu. Adding an action to the global actions menu is a lot like adding an action to a record page. You simply drag an action from the palette onto the global publisher layout. You’re already in the right place in Setup, so click Publisher Layouts. Click Edit next to Global Layout. If the Salesforce Mobile and Lightning Experience Actions section isn’t customized, click to override it. Click the Mobile & Lightning Actions category in the palette. Drag New Campaign from the palette into the Salesforce Mobile and Lightning Experience Actions section and save the layout. Refresh the browser, then click to check out the global actions menu. There’s the New Campaign action. Nice work! Now anyone at Ursa Major Solar can create a new campaign.